I have an application that requires we run Linux Debian Jessie, and I would like to have Synergy working with a Windows 7 machine directly next to the Linux machine. We also were hoping to have the Debian machine dual bootable, with windows 10 so that if needed we can boot into Linux or Windows and have Synergy working with the server running on the windows 7 machine and the clients being Debian or Windows 10 (Depending on what is booted). We have been somewhat successful in getting Debian working, but we have an issue that when we move from the Debian screen to the windows 7 screen, the debian computer goes to sleep immediately. Also, we are not able to control the boot menu on the Linux/windows client when the boot menu comes on. 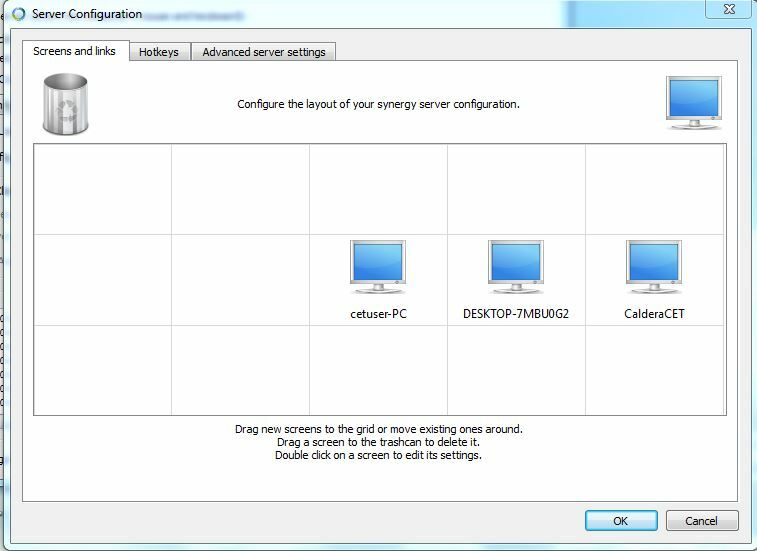 Finally, how would we arrange the windows for having the windows/Debian PC to the direct right of the windows 7 server machine (since only one machine will ever be on at one time)? It seems that the Linux client does not have an SSL fingerprint generated. Can you try stopping Synergy on it and close/quit Synergy then reboot machine. After rebooting, launch Synergy and check if it generates an SSL fingerprint. The generate ssl certificate checkbox was off on the linux machine. When I enabled it there was no longer any sleep when switching screens. Thank you! Any ideas on the second part of my question? How do I select the OS to boot in grub2 when the computer boots if that dual boot computer is the client and does not have a keyboard/mouse attached to it? 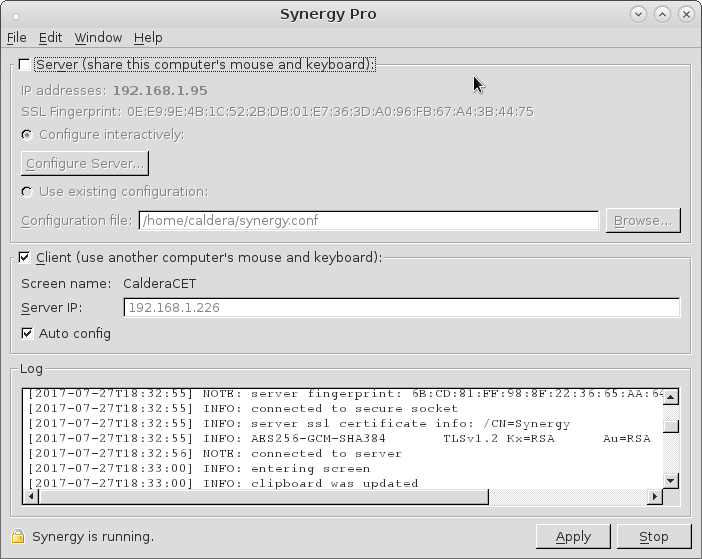 *** WARNING *** The program 'synergy' uses the Apple Bonjour compatibility layer of Avahi. and the screen goes immediately black. if you move the mouse to the server computer and then back to the client it sometimes comes back. Can you check this @JeffA? @Paul Suarez The issue is not with the dual boot and grub, the issue is that synergy is not loaded so I do not have a keyboard and mouse when grub loads so I can not select which os to boot into. Sorry for being unclear. @JeffA, Synergy needs to run in an Operating System. This might not be possible on your current setup. But I wonder if you could set something on that machine to have it boot on the OS where you want Synergy to work in after an N number of seconds(unless you want it to work with both OS). @Paul Suarez Thanks for the reply on that. I kind of figured that was the case. Any insights into the other issue though? Where when I leave the linux client screen and then re enter it the screen goes black? See my post above. That's interesting @JeffA. I actually just found out that we have a somewhat similar setup. I'm using an HP 2570P here with Windows 7 and Ubuntu 16.04 with Grub as well. But I am not experiencing such issue. 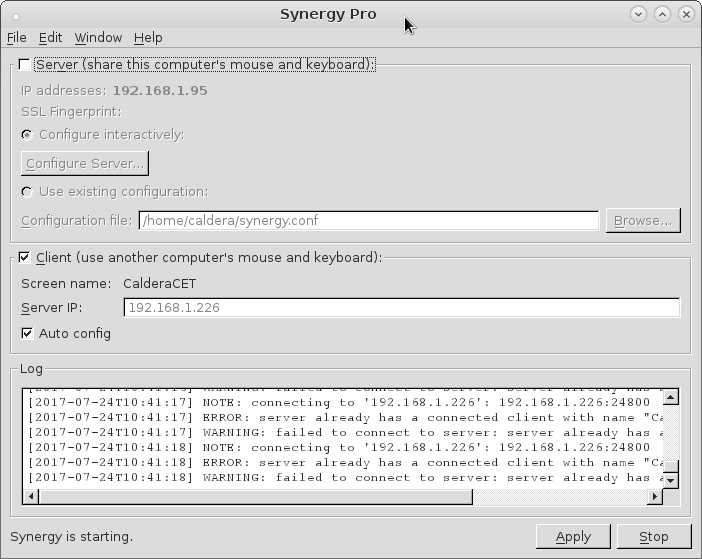 Can you try disabling auto-start of Synergy and check if you experience the same thing? @Paul Suarez The autostart was not set up yet. This happens as soon as I start Synergy. I have started it via the command line, and also by clicking on the app in the menu.